Graduated with B.Sc in Honours Computing and Computer Electronics from Wilfrid Laurier University. Over 13 years of experience developing database driven websites/applications, working with a wide range of web technologies. At UHN, Viet has been involved in the design and implementation of several advance clinical documentation projects. Viet has extensive experience working with other hospital systems and setting up interfaces to integrate data. 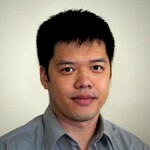 In 2003, Viet was on of the top three winners in the Canada Cannes Young Creatives competition.